Your posture and alignment are a very important part of the way you carry yourself and that affects both how you look and how you feel. Today I am pleased to have Carrie Harper, a fitness professional with over 20 years of experience in group and personal training and the author of the new book, “Flatten My Postpartum Belly,” share with us how to fix your posture and alignment. Her book shares the method she has developed to help people heal from Diastasis Recti and other core injuries and dysfunctions. 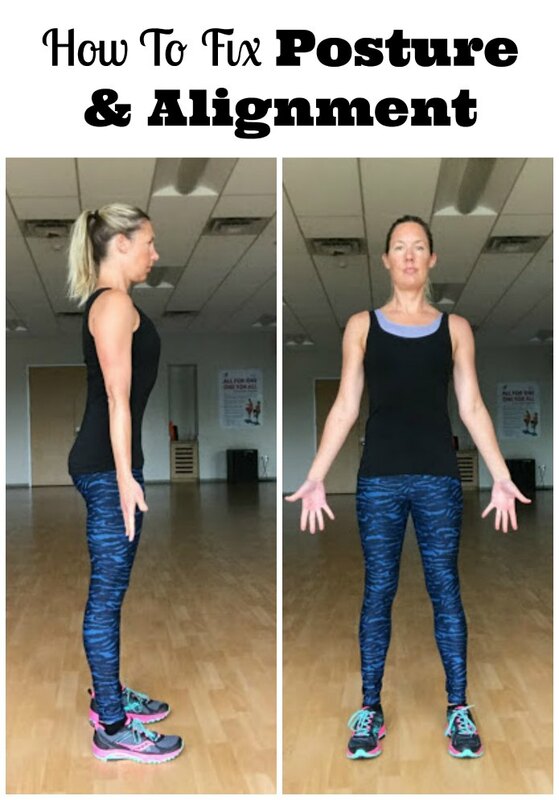 The steps Carrie Harper shares with us on how to fix your posture and alignment are all at once super simple and sort of hard to do. It can be hard to break old bad habits and develop new good ones but a little work is so worth the results. Improving your posture and alignment really does result in instant results- you will look taller and slimmer! Harper. Excerpt from Chapter 5: The ABC’s, Copyright 2018, with expressed consent from Carrie Harper. All rights reserved. Your mom was right in the sixth grade when she told you to stand up straight and stop slouching. Not only does it make you look and act more confident, but sitting and standing with good posture reduces pain, relieves symptoms, and helps you heal, all at once. I say “all at once,” and what I mean is “have patience and give yourself grace.” This is because, depending on how much time you have been out of alignment, you may find re-aligning yourself is difficult and maybe a little painful. The pain is caused by using muscles that may have been sitting dormant for a while, or even from resetting your skeleton, which tends to adjust to how you hold it. This is the part where your chiropractor thanks me for bringing this to your attention. Your mom will thank me, too. Take a picture of your full frame from head to foot. Take another one from the side. It helps to have a partner help you with this. From the front view, notice the length of your neck, and whether your shoulders are even. If your neck looks short, you might be protruding your head forward or holding your shoulders high. Now, we’re going to start resetting your posture and alignment. It may be uncomfortable at first, and will actually take practice to maintain. Your crown sits on the top back part of your head, over your ears, like you’re looking straight forward, not down or up. Press up through the crown of your head. For most people, that means pulling the chin in and lengthening the back of the neck, which is the top of your spine. palms to the front. It helps set the shoulder. Now, doing all of that may have set your ribcage forward, so use the top of your abdominal wall to pull your ribs in so that the ribs lay flat across the front and over your pelvis, not in front of your pelvis. Push down through the base of your spine. Don’t tuck your tailbone like a scorned puppy. Just press the base down slightly. You will feel an engagement happen in the front of the body, around the navel and pelvis. The two points to notice here are the top of the pelvis and the actual hip joint. They should be in direct line. Finally, the legs are directly under the hip bones. Take a new picture. How did you do? moving around, be conscious of the length of your spine. Use your legs and hips to bend and move, rather than slumping down with your spine. Set up your workstation so that you can sit up straight. If you are breastfeeding, set up a breastfeeding station that cushions you so that you can sit up straight. Like I said, this may be exhausting at first. It takes practice. Give yourself grace. Take breaks. The best way to take breaks is to sit in a chair with a sturdy back, lie on your back, or lean against a wall. The best way to practice is to have an hourly reminder on your phone, or to adjust every time you pass a window or mirror. Did you notice a difference from the first to the second picture? Do you look instantly taller and slimmer? Yes, posture does that, too. It’s an instantly more long and lean physique, and can help you enter a room with confidence! If you have been struggling with pain and discomfort anywhere in your body, start to take notes on your pain level. You may find that this alone has solved many of your problems. I hope you enjoyed these tips on how to fix your posture and alignment. Getting your body back after baby is a process so be patient and keep plugging away at it at the same time! Do you think you will get the book, “Flatten My Postpartum Belly,” for even more great tips on improving your body’s health? Ummm…yes please! Especially with Thanksgiving around the corner! Saved as a favorite, I really like your web site and your advice about correcting your posture.